Drama. IAMGOLD Corporation has reduced exploration activity in the extraordinary and fabled west African country of Mali as a security precaution during political and civil unrest (The Canadian Press, January 23, 2013, Iamgold shares drop eight per cent day after miner reduces Mali exploration). 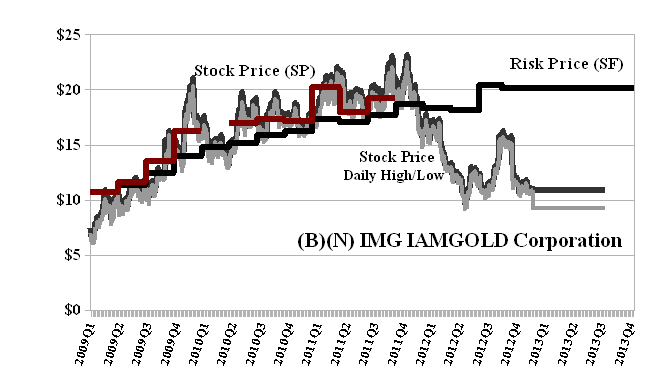 It’s evident from the Risk Price Chart (please see Exhibit 1 below) that investors have been writing down the Company’s ability to produce its otherwise substantial gold and other mining interests which have not declined but increased since 2011 when the stock price was better than $20. The Company has a current market value of about $3.4 billion which is less than half of what it was a year ago and substantially below the Risk Price (SF) at $19 and an implied acquisition price of $7 billion at the present time. Governments, of course, never pay the market price and, after all, gold is just money with a significant production cost. Iamgold Corporation is a mid-tier gold mining company producing approximately one million ounces of gold annually from five operating gold mines on three continents in Canada, South America and Africa.